The worldwide climate debate has been a constant theme in politics, business and the media for the last few years. Given the growing demand for more environmental protection and resource conservation by the general population, many companies are also thinking on how to base the development and manufacture of their products on greater sustainability. Above all, ever-rising crude prices lead the plastic industry to invest increasingly in research and development of bioplastics. Increased demand for bioplastics provides for an expansion of production capacities. These plastics have led a niche existence so far, and have barely managed to establish themselves on the market. This could however change in a relatively short time span, with both companies and experts foreseeing an economic opportunity for bioplastics. Exact worldwide bioplastics production figures and capacities are difficult to determine. They are mostly only based on estimates, and these are constantly changing due to the rapid growth of the bioplastics industry. The most reliable estimates are probably published by European Bioplastics. According to its latest surveys the production capacity has quadrupled from 2007 to 2010 due to the double-digit growing rates in the industry. Furthermore European Bioplastics announced in May 2011 that global production capacity would rise to over 1 million tons per year in 2011. The figure on the "Global Production Capacity of Bioplastics," shows that European Bioplastics expects a continious growth of production capacities in the next years. It is expected, that the increase upto 1.710 kt in 2015 is mostly caused by non-biodegrable plastics. 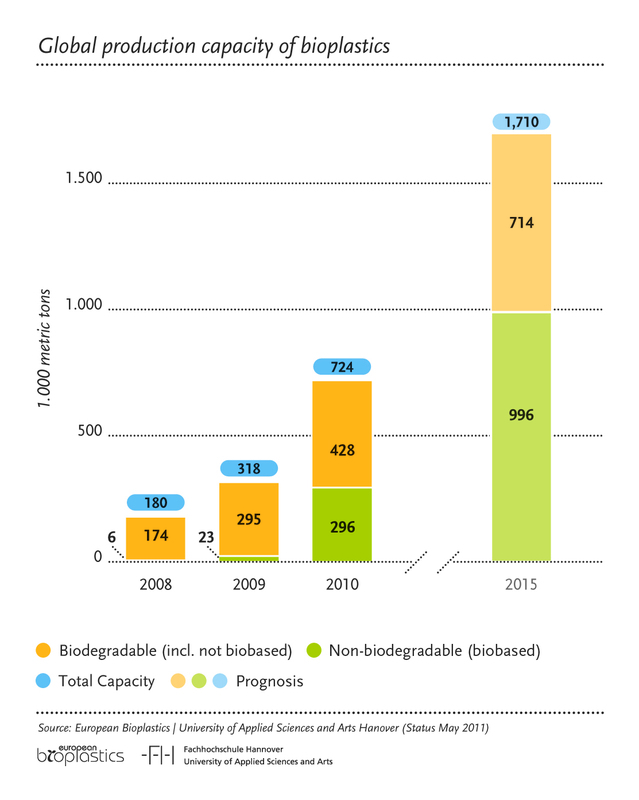 The production of durable bio-plastics in 2008 was still at 6 kt, while about 1000 kt are expected for 2015. This is in line with a notable increase in the demand for non-degradble bio-plastics as they are used in more and more applications. The production of bio-polyethylene by Braskem as well as Dow, Crystalsev and the BASF products are mainly responsible for this development. However, the production capacity for bio-degradable plastics is expected to rise, too. For example the world market leader for PLA, Natureworks, has recently announced the construction of a new plant in SE Asia with a yearly capacity of 140kt, which will be completed by 2015. Our free short report "Bioplastics - Economic opportunity or temporary phenomenon?" is available for download here for more information on the development of the bioplastics market.